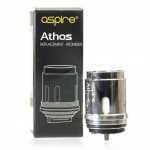 Aspire Athos Replacement coils come in two variations for two different vaping experiences. These coils will not work on any other atomiser and are only compatible with the Athos Tank. Majesty Luxe Edition, an amazing kit deserving the name of masterpiece. It has ritzy, glossy appearance, every detail of the mod is telling you what exquisite means. It can reach a maximum output of 225W, with which you can enjoy massive vapor; and it has high-definition user interface, which can offer you comprehensive vaping data. Moreover, the ergonomically designed fire key can provide you with easy operations. TFV12 Prince tank is included in this kit, powerful cores and large capacity are born with this Prince. 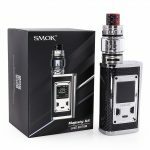 The Smok R-Kiss Kit is a 200 wattage mod and tank kit that features a simplified menu system and the TFV-Mini V2 Tank and is one of the worlds smallest dual 18650 kits. The VOOPOO UFORCE T1 Sub-Ohm Tank is the updated rendition of the original UFORCE, implementing a futuristic Steam Punk design to the structure while introducing new types of mesh materials for the UFORCE OCC Coil System. The UFORCE T1 integrates a mechanical knurl design to the bottom and top base of the tank, providing a visually stunning design while providing top-level ergonomics. The bottom base measures 24.6mm in diameter with bulb glass reinforcement featuring a staggering 8mL maximum of eLiquids. The UFORCE T1 includes the standard 0.4ohm U2 Dual Coil and the new 0.13ohm UFORCE N1 Single Mesh Coil rated for 50 to 100W. 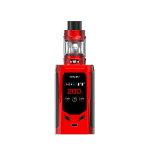 Airflow enters the structure through three external air slots located at the bottom base, traveling upwards towards the atomizer chamber for a tremendous cloud delivery.